A humanoid robot known as Pepper has become one of the first to take payments in a restaurant. Google has released a set of APIs for its new Android Pay payment solution that should speed up the deployment of NFC-enabled devices used to make contactless payments. Contactless card transactions in Europe increased three-fold over the last twelve months, a report by Visa has revealed. 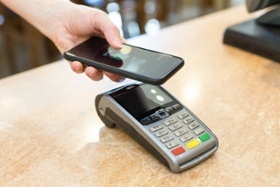 The global market for mobile and wearable contactless payments is estimated to reach $95 billion annually by 2018, up from less than $35 billion last year, according to new data by Juniper Research.